The Montauk Project refers to a series of top-secret experiments based out of an old Air Force radar station. Apparently this Air Force radar station had a vast complex hidden below it. The Rainbow Project was a top secret military operation to develop a system that would turn vessels invisible on enemy’s radars – it was the first attempt at creating a form of stealth technology. 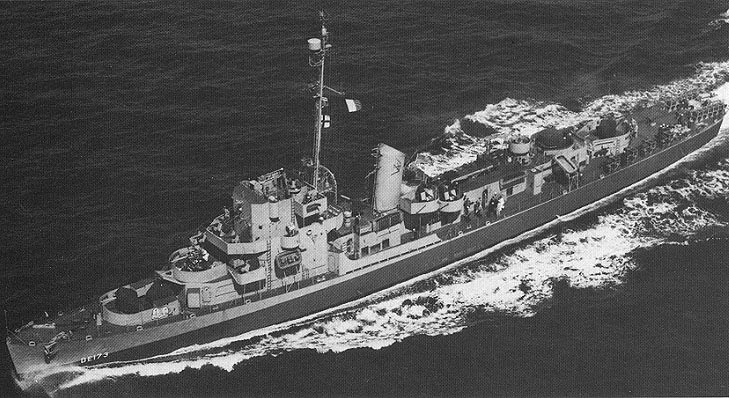 The vessel that underwent these strange tests was a navy destroyer named the USS Eldridge. This ship was housed at the Philadelphia Naval Yard. The entire ship turned completely invisible and morphed to the coast of Norfolk, Virginia. This whole process only lasted a few seconds before the ship reappeared in Philadelphia. When the ship returned a panic ensued to make sure everything was alright. The military quickly scanned the outside of the ship and were thankful to see everything seemed in place. They then boarded and entered the ship to find horrific scenes. The majority of the crewmen on the ship had perished due to the fact they had been fused into the metallic structures of the ship. The few survivors from the ship had gone completely insane by the inhuman ordeal – there was no return for them either! The government and the top military officials new they had crossed the line and pulled all funding from the Philadelphia Project – this could never happen again! The funding was instead channeled into the Manhattan Project where they hoped to have more success with a new military weapon – we all know how that turned out! A lot of the scientists and military officials involved in the original Philadelphia Project knew that they were onto something big – they could not just leave this idea fade away! The possibilities were endless and in their opinion they far outweighed the dangers. They decided among themselves to ignore their peers and somehow carry on with these dark experiments. So a secret experiment base was built at the radar station in Long Island where they knew they would not be disturbed by the public. This obsolete air force station was known by the code name Camp Hero. The spot was extremely close to New York city but the immediate area around it was quite sparsely populated – this was the perfect spot for the experiments to continue! By the 1960’s a huge subterranean complex was completed at Camp Hero and the experiments were again allowed to flow. Mind control experimentation seems to have been the most popular project at the complex. Young men from all of the country were ‘gathered’ and brought there because of their psychic abilities. A unique and powerful medical chair was built to enhance the test subject’s latent psychic abilities. The men were made to sit in this chair as the scientists hammered it with various forms of energy waves. When the subject’s were being subjected to this mass of energy the scientists were finding it possible to actually control them. They found out that the most adept of these male psychics was able to focus on objects so intensely that the objects would momentarily physically materialize. This young psychics name was Duncan Cameron. The scientists began to use Duncan Cameron’s elite powers to manipulate reality and open dimensions where man had no business being. Time itself was at the mercy of these manic scientists and onlookers new that things were fast getting out of hand. It got to the point where wormholes were constantly being created so that the head scientists could manipulate time. It was decided that a huge experiment would take place and they would use one of these wormholes to travel back in time 40 years. They wanted to arrive at a point in time just before the events on the USS Eldridge took place. If they managed to get back there maybe they could inform the military where they went wrong? The scientists who were against these tests saw their chance to end the madness once and for all and turned towards Duncan Cameron’s elite powers. When this brave new experiment was taking place they got Cameron to unleash all manner of crazy powers to stop the rot once and for all. The result was catastrophic for the Montauk Project experiments with time. Every wormhole and time travelling device housed there was destroyed by Duncan Cameron’s impressive psychic abilities. The Montauk Project was at a point of no return – the base was practically destroyed and all of the scientists work had gone with it. The young psychic’s who had been housed there were brainwashed so that they could not repeat what they had witnessed there. They were then released back into the world. What are your opinions on Camp Hero? Do you think it’s now nothing more than a derelict site for teenage stoners or do you think some form of experimentation still takes place there?